At Appear Photography our passion is capturing those precious fleeting moments of pregnancy and childhood so you can relive priceless moments again and again. We're a full-service studio and we want to help guide you every step of the way, from planning your custom photo session to choosing beautiful, heirloom quality wall art, custom-designed albums and other specialty items. If you're expecting, have just had a baby or if you have older children, we would love to hear from you! Newborn sessions take place at our studio in Hoover, AL when baby is 2 weeks or younger. The session is fully styled and includes 4-5 different backgrounds/setups and multiple poses. A large selection of props and accessories is provided. Parents and siblings may be included in the session. Newborn sessions take place at or studio when baby is 2 weeks or younger. The session is fully styled and includes 3 different backgrounds/setups and multiple poses of baby alone. Only wrapped (or swaddled) poses are included with this type of newborn session. A large selection of props and accessories is provided. Session lasts up to 1 hour. Photo sessions take place at a location of your choice in the Birmingham, Alabama area or at our studio in Hoover, Alabama and last up to 1 hour. Outfit changes and special props are welcomed. We offer a selection of outfits and accessories for babies and toddlers. Mini sessions are great for older children and families who are interested in a shorter, more basic session. They can also be used to capture important milestones in baby's first year. These sessions take place in studio in Hoover. They include 1 background with 1 outfit and last up to 20 minutes. 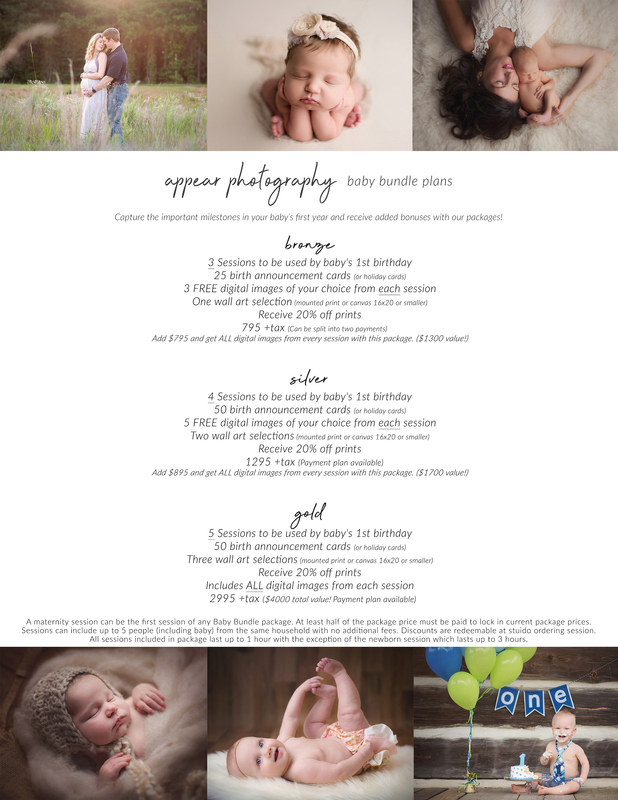 Give the perfect gift of professional photography! Ask about purchasing a gift certificate for a loved one. Please be sure to "like us" on Facebook and follow us on Instagram!